The winter season is coming and alongside the millinery winter collection! This winter, headpieces are the trendy must have accessories. Indeed, the trend on the last fashion catwalk was the hat wearing, we could appreciate all kind of style from the beret to the turban. The haute couture brands are all putting the millinery on top, creating new forms and fusing several type together. Since some seasons, creators are reinventing and reusing the millinery art, on fashion show the hats are making a wonderful comeback, it was for a few years left out to privilege the sophisticate hairdressing. We have been witnessing the return to grace of the headgear, long neglected by the profile of headphones and sophisticated hairstyles. On the occasion of the Paris Fashion Week autumn-winter 2018-2019, more doubt possible nevertheless: the caps / berets / hats are THE accessories to put on. 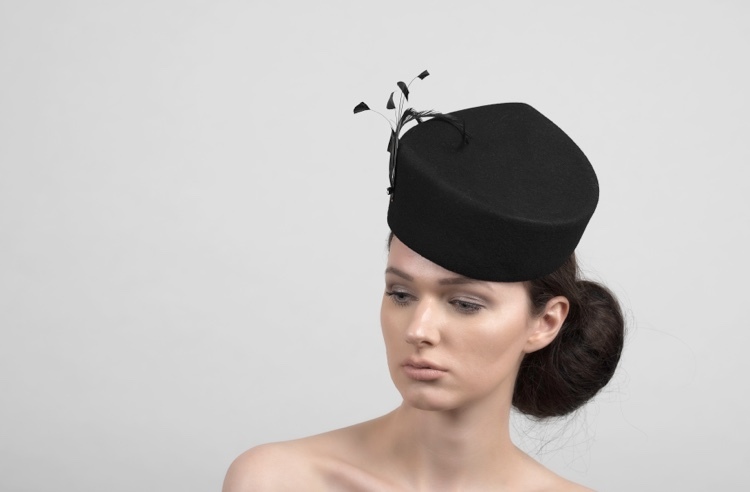 Katherine Elizabeth Millinery just released her new collection. Here is some shoot of these unique pieces, the dominant colours are darks tones which gave a sophisticated atmosphere for the Christmas holidays. This winter headpiece is inspired from a Russian woman’s style made with felt and luxury faux fur. This felt piece is a hand sprayed pattern with grey and black colours. It is inspired from the form of the French beret, Katherine has mixed the beret form in a different way to give her hat a timeless feel. This hat manages to create the perfect harmony between black & grey colours, this choice is giving out a classical feel with fantasist forms! This piece is an elegant headpiece that reminds us of a British classical vintage pillbox form. The feathers add a fancy touch to this design.